Queens, New York City, U.S.
Leslie Odom Jr. (/oʊdəm/, born August 6, 1981) is an American actor and singer. He has performed on Broadway and in television and film, and has released two solo jazz albums. He is known for originating the role of Aaron Burr in the Broadway musical Hamilton, a performance for which he won the 2016 Tony Award for Best Actor in a Musical and the Grammy Award for Best Musical Theater Album as a principal vocalist. His television roles included Sam Strickland in the musical series Smash (2012–2013). He is also the author of the 2018 book Failing Up. Odom was born in Queens, New York. His family later moved to the East Oak Lane section of Philadelphia, where he grew up. He attended Julia R. Masterman School for middle school and Philadelphia High School for Creative and Performing Arts for high school. He and his family attended Canaan Baptist Church in the Germantown section of Philadelphia, where he sang solos in the church choir. He earned a degree with honors at Carnegie Mellon University in Pittsburgh, Pennsylvania, and then moved to Los Angeles in the summer of 2003. Odom sang as a teenager, and studied musical theatre in college. At the age of 17 he made his Broadway debut as Paul in Rent. In 2000, he appeared in the ensemble of the one-night Broadway concert version of Dreamgirls. He spent much of his time doing theatre in LA, including in 2010 with Leap of Faith, which moved to Broadway in 2012, with him starring as Isaiah Sturdevant. The show closed shortly afterwards, however he made the move to New York and relocated there. After starring off-Broadway in Venice, and in Witness Uganda (later retitled Invisible Thread) at A.R.T. and in workshops, Odom worked with Lin-Manuel Miranda in the Encores! Off-Center production of Tick, Tick... Boom! playing Michael. Odom also played Nat King Cole in the 2015 one-night Actors Fund of America benefit concert of Bombshell. Odom was nominated for a 2015 Drama Desk Award for Outstanding Featured Actor in a Musical for the role of Aaron Burr in the off-Broadway production of Hamilton at The Public Theater. He continued in the same role at the Richard Rodgers Theatre after the show transferred to Broadway later that year. He also won a 2016 Grammy Award for the cast album, and won the Tony Award for Best Actor in a Musical. 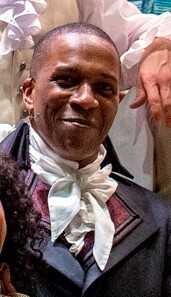 Odom's final appearance in the role of Aaron Burr in Hamilton occurred on July 9, 2016. Odom had a recurring role on CSI: Miami which began in 2003. He appeared as Joseph Kayle in nine episodes before leaving in 2006. He followed with a recurring role on Vanished, appearing in 10 episodes as Maliko Christo. From 2006 to 2007, he held a recurring role as Freddy on Big Day, appearing on nine episodes prior to its cancellation. He also had a supporting role in the TV movie Poe in 2011. In the musical television series Smash, Odom had a recurring role as Sam Strickland in 2012, and was promoted to a starring role for the show's final season in 2013. In late 2013, Odom was offered the leading role of Lucas Newsome on State of Affairs. He accepted the role, but ended up backing out to take the part of Aaron Burr in the workshops of the musical Hamilton. In 2013 and 2014, he had a recurring role on Person of Interest as Peter Collier, appearing in eight episodes. He also played Reverend Curtis Scott in seven episodes of Law & Order: Special Victims Unit between 2013 and 2015. Beginning on May 19, 2016, Odom hosted the Broadway.com web series Aaron Burr, Sir: Backstage at Hamilton with Leslie Odom Jr., with a new episode being uploaded every Thursday for eight weeks. Odom was also set to play Jimmy Jam in a 2017 miniseries about New Edition, but ended up leaving the project. He has made guest appearances on several shows including Gilmore Girls, Grey's Anatomy, Supernatural, and The Good Wife. In 2016, Odom was also featured in a commercial for Nationwide Insurance. On February 4, 2018, Odom sang "America the Beautiful" during the NBC broadcast of Super Bowl LII. Odom has appeared in short films, and had a supporting role as Declan Hall in the 2012 war film Red Tails. He played Dr. Arbuthnot in Kenneth Branagh's 2017 adaptation of Murder on the Orient Express. In 2014, Odom self-released his debut album as a jazz singer, Leslie Odom Jr. on CD and SoundCloud, and promoted the album with several concerts at The Public Theater. In February 2016, he released a version of Selena Gomez's "Good For You" featuring his Hamilton castmate Daveed Diggs. Odom was signed to a four-album deal with S-Curve Records in 2016. He and producer Steve Greenberg narrowed down 200 potential tunes to ten tracks, and Odom recorded an updated and improved version of Leslie Odom Jr. during days off and afternoons before Broadway performances, in order to release the album before Odom left Hamilton. Released in June 2016, the album charted at No. 1 on Billboard Jazz and No. 147 on Billboard 200. On November 11, 2016, Odom released his second album, Simply Christmas, which featured jazz interpretations of Christmas standards. A deluxe edition of the album was released in October 2017, with four additional songs. Odom tours to promote his albums, performing concerts backed by a jazz quintet that includes a drummer, percussionist, bassist, guitarist, and a pianist who is also Odom's musical director. In June 2017, it was announced that Odom had a book deal for Failing Up: How to Take Risks, Aim Higher, and Never Stop Learning, which he was writing with the intention to inspire younger readers. The book, which was published by an imprint of Macmillan in March 2018, "outlines the setbacks and rejections that preceded his success." Odom modeled his writing on the style of a commencement speech, exploring what he had learned throughout his life and the importance of pursuing passions. Odom has been married to actress Nicolette Kloe Robinson, since December 1, 2012. Their daughter, Lucille Ruby, was born on April 23, 2017. The couple met in 2008, when she was a student at UCLA and auditioned for Once on This Island in Los Angeles. When Robinson replaced a cast member who left unexpectedly, assistant director Odom became responsible for bringing her quickly up to speed, and a romantic relationship ensued. Robinson has since appeared in the off-Broadway musical Invisible Thread (2015) and the television series The Affair., as well as starred in the Broadway musical Waitress from September 4th, 2018 through December 9th, 2018. 2014 Tick, Tick... Boom! Michael June 24–28, 2014 New York City Center Encores! This section of a biography of a living person needs additional citations for verification. Please help by adding reliable sources. Contentious material about living persons that is unsourced or poorly sourced must be removed immediately, especially if potentially libelous or harmful. 2004 The Big House Lamont Episodes: "A Friend In Need", "Almost Touched By An Angel"
2006 Threshold Sergeant Adams Episode: "The Crossing"
2006 Gilmore Girls Quentin Walsh Episode: "Bridesmaids Revisited"
2006 Close To Home Jordan Carter Episode: "Prodigal Son"
2007 The Bill Engvall Show Mr. Pratt Episodes: "Good People", "Feel Free To Say No"
2008 Grey's Anatomy P.J. Walling Episode: "There's No "I" In Team"
2011 NCIS: Los Angeles FBI Agent Duane Lausten Episode: "Archangel"
2011 Zeke and Luther Mr. Arliss Bunnyson Episode: "Zeke, Luther, and Kojo Strike Gold"
2011 Bandwagon Urban Glee performer Episode: "You Can Do Anything"
2011 Supernatural Guy Episode: "Season Seven, Time For A Wedding"
2012 House of Lies James Episodes: "Ouroboros", "Veritas"
2014 Gotham Ian Hargrove Episode: "Harvey Dent"
2016 The Good Wife Barry Pert Episode: "Unmanned"
2018 We Bare Bears Dr. Leslie (voice) Episode: "More Everyone's Tube"
"Have Yourself a Merry Little Christmas"
"What Are We Waiting For"
"All I Want For Christmas Is You"
"Sondheim: Medley: Children will Listen / You've Got to Be Carefully Taught (From "Into the Woods" & "South Pacific")"
^ "Leslie Odom Jr". IMDb. Retrieved April 1, 2017. ^ a b "Former Hamilton Star Leslie Odom Jr. Has a Book Deal". U.S. News & World Report. June 9, 2017. Archived from the original on February 9, 2018 – via Associated Press. ^ "Vault: Leslie Odom, Jr". Playbill. Archived from the original on October 31, 2017. ^ a b Whelan, Aubrey (December 28, 2015). "Leslie Odom Jr.: Being Burr in Hamilton like falling in love". Philadelphia Inquirer. Archived from the original on January 17, 2016. ^ Gray, Ellen (March 19, 2013). "Local actor gets his Smash close-up". Philadelphia Daily News. Archived from the original on August 22, 2017. ^ a b Leslie Odom Jr. at the Internet Broadway Database. ^ "Bombshell Benefit Concert Raises More Than $800,000 for The Actors Fund". Actors Fund. Retrieved October 28, 2016. ^ Paulson, Michael (June 19, 2016). "Leslie Odom Jr. to Leave Hamilton on July 9". The New York Times. Archived from the original on December 26, 2017. ^ iSpot.tv (2016). "About Nationwide Insurance TV Commercial, 'Songs for All Your Sides' ft. Leslie Odom Jr". iSpot.tv Real-time TV Ad Analytics. Archived from the original on February 12, 2017. ^ Nationwide Mutual Insurance Company (2016). "Leslie Odom Jr., Song For All Your Sides". Nationwide | Newsroom | Ads. Retrieved February 12, 2017. ^ Gans, Andrew (January 13, 2018). "Hamilton Tony Winner Leslie Odom Jr. Will Sing at the Super Bowl". Playbill. Archived from the original on January 14, 2018. ^ Fleming, Jr., Mike (September 29, 2016). "Johnny Depp To Star in Murder on the Orient Express At Fox". Deadline. Archived from the original on November 16, 2017. ^ Bailey, Alyssa (February 12, 2016). "Listen to the Stars of Hamilton Cover Selena Gomez's 'Good for You'". Elle. Archived from the original on January 2, 2018. ^ "Leslie Odom Jr. to leave Hamilton in July". Associated Press. June 20, 2016. Archived from the original on August 22, 2016. ^ Lee, Ashley (June 30, 2016). "Hamilton's Leslie Odom Jr. Talks Jazz Album, Residency Dreams and Potentially Playing Aaron Burr Again (Q&A)". The Hollywood Reporter. Archived from the original on February 14, 2017. ^ Snyder, Diane (October 27, 2017). "Leslie Odom Jr. Talks His New Christmas Album, Life After Hamilton & More". Billboard. Archived from the original on December 28, 2017. ^ Roa, Ray (June 20, 2017). "Interview: Song and dance man — Hamilton star Leslie Odom Jr. breaks out with an album and tour". Creative Loafing. Tampa Bay, Florida. Archived from the original on September 20, 2017. ^ a b Gans, Andrew (June 9, 2017). "Hamilton Tony Winner Leslie Odom Jr. Penning Inspirational Book". Playbill. Archived from the original on September 15, 2017. ^ a b c d Spaner, Whitney (December 15, 2015). "How Hamilton's Leslie Odom, Jr. Took His Shot With Nicolette Robinson". Playbill. Archived from the original on June 17, 2017. ^ Fierberg, Ruthie (April 25, 2017). "Hamilton's Leslie Odom Jr. and Wife Nicolette Robinson Welcome a Baby Girl". Playbill. Archived from the original on June 21, 2017. ^ "Leslie Odom Jr. | TV Guide". TVGuide.com. Retrieved December 17, 2018. ^ "Listings – WE BARE BEARS on Cartoon Network". The Futon Critic. Retrieved August 10, 2018. ^ "Clip: Leslie Odom, Jr. Raps Bear Facts in We Bare Bears". Animation Magazine. Retrieved August 10, 2018. ^ Carnegie Mellon University (April 2, 2019). "Tony & Grammy Winner Leslie Odom, Jr. To Deliver Commencement Address - News - Carnegie Mellon University". www.cmu.edu. Retrieved April 9, 2019. This page was last edited on 9 April 2019, at 16:25 (UTC).